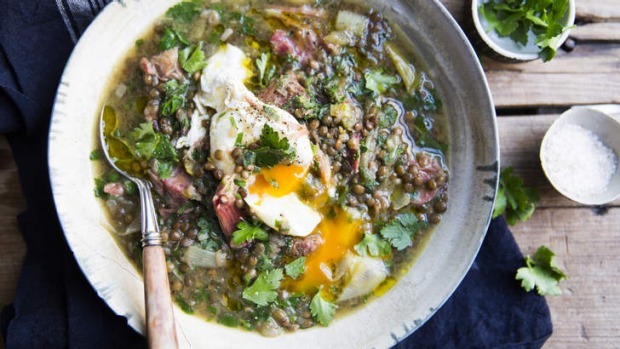 This version of ham hock and split pea soup switches the legumes to lentils, which are such a harmonious match with smoked hock meat, and I've also added some poached eggs, which I love with braised lentils. This is a great warming lunch dish on a cool day, and up there as one of my ideal late breakfast or brunch dishes. Add the hocks to a medium saucepan and cover with water. Bring to the boil and cook for five minutes. Drain the hocks and add back to a clean saucepan. Cover with 4½ litres of water and simmer for 40 minutes, skimming as necessary. Meanwhile, add the lentils to a saucepan of boiling water. Bring up to a simmer and drain. Heat the oil in a large saucepan over medium heat. Add the onion, leek, garlic and celery and cook for about 10 minutes until golden. Add the bay leaves, celery seeds and lentils and stir through. Add the hocks and their broth and simmer for 40 minutes, skimming if necessary. When the meat is coming away from the bones, turn off the heat, remove the hocks and set aside. Once cool enough to handle, pick off the meat and discard the skin and any gristly bits. Break the meat into bite-sized pieces and add back to the pan with the parsley. Adjust the seasoning if necessary and cook for five more minutes. To serve, poach the eggs to your liking. Serve each bowl of soup with an egg, a drizzle of oil and a good grind of pepper. 1. Ask your butcher to cut the hocks in half, which makes them easier both to fit in the pot and to strip of meat. 2. Split peas would work well instead of lentils. 3. Enrich this soup with carrot, parsnip, fennel, or celeriac, or stir through some blanched kale leaves.